October is finally coming to an end, and with it, Breast Cancer Awareness Month. Several of my clients did population health outreach campaigns around mammograms and breast cancer screening. It’s rewarding to see that so many patients were reminded of the need to stay on top of preventive health care. 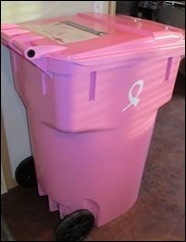 I literally ran across one of these pink carts on my morning jog, with its “Kick Cancer to the Curb” slogan. Definitely an interesting campaign, but I’m wondering how long it will be until a veritable rainbow of carts for other diseases starts to appear. They could probably get some traction with medical offices and shredding services, replacing the standard boring carts with disease-awareness ones. I’m a big fan of focused population health outreach campaigns, which we used to refer to as “disease of the month” at my practice. With the advent of unquestionably powerful population health applications, it can be overwhelming to start robo-calling or texting patients who are overdue for multiple screening and interventions. I recommend that my clients gradually work their way into full-scale reminders, selecting first a disease or condition that is either of high prevalence in the community or of key importance to the practice. Once the staff is familiar with managing patients who respond to the outreach messages and can handle the volumes it may bring in, it becomes easier to incrementally add additional outreach campaigns. I also recommend they put signage in the offices and provide relevant patient education material as well as educating the staff through in-services. That way everyone in the office can assist as patients respond. It’s tempting to fire up multiple campaigns at the same time, but unless your system is sophisticated enough to combine reminders, it can quickly become annoying. Even if the reminders are combined, I’m not sure I would want to be a patient on the receiving end of a laundry list of preventive services being read to me by a disembodied computer voice. I’ve spent a fair amount of time over the last decade helping practices redesign their offices, not only from a workflow perspective, but also architecturally. Transitioning to an EHR works best with appropriate exam room layouts. Getting rid of the chart room usually frees up space that can be used either for employee engagement or revenue generation. I’ve worked with quite a few office designers and am always interested in looking at computer carts and other equipment at HIMSS. One of my designer friends shared information on the Beam Virtual Playground, which is a ceiling-mounted projector that creates a “touch screen” on the floor for games. I like the idea, and the fact that it’s germ free is a big plus. I’m always astounded when I see well-chewed books and slobbery toys in medical waiting rooms. ‘Tis the season for vendor user groups, and apparently I’m attending all the wrong ones. This week’s IBM Insight conference featured an exclusive performance by Maroon 5, sponsored by Rocket Software. Talk about a client appreciation event. And for those working the show from the vendor side, not a bad day at the office. I had a couple of days off this week and spent most of them trying to tame the email monster and complete long-overdue tasks. Thank goodness for being able to work anywhere. 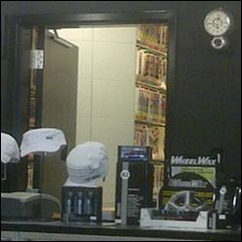 As I was hanging out at the car dealer having my oil changed, I got a glimpse behind the scenes at something that resembled a medical chart room. I was surprised since this is a high-tech dealer who appears to do everything electronically from checking you in with the electronic code on your car key to sending email reminders. Apparently they have a dark secret, however. I’m glad that the people who make chart tabs and other filing accessories found another line of business since we don’t need them very much any more in medicine. I’ve got two conferences to attend in the next three weeks, so it will be good to get things squared away before I go back on the road. The only thing left to do is purchase candy for Saturday night. Thanks to Travel+Leisure magazine for providing these wine pairings for Halloween candy. I’m not sure I agree with some of their selections (Hot Tamales and Riesling, anyone?) but I can definitely get on board with Raisinets and Merlot. What’s your favorite candy and beverage combination? Email me.